Laser hair removal is the best solution to removing inconvenient underarm hair. With a fast treatment (less than 10 minutes!) and permanent results, you’ll transform your armpits to smooth underarms in no time. Laser hair removal is the best solution to remove inconvenient underarm (a.k.a. armpit) hair. Treatments are fast — underarms take under 10 minutes! 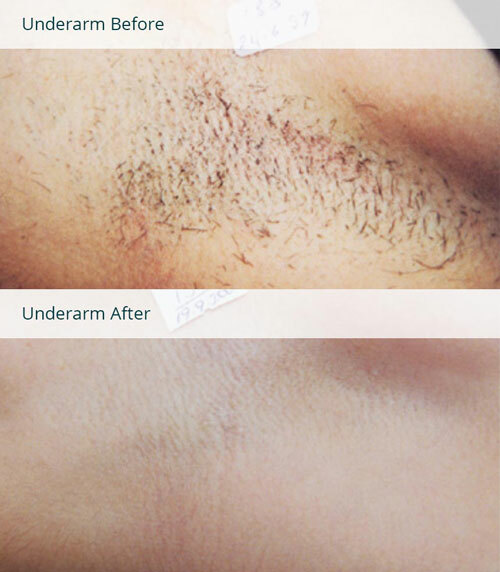 Results are permanent so you’ll never shave again. Beauty does not have to be painful. Especially since lasers are much less painful than waxing. Soft, smooth underarms are here to stay. Years of shaving can make the sensitive skin in the underarm rough. Problems like ingrown hairs, and razor bumps can be uncomfortable and even result in scarring. With laser hair removal, the protective skin is not disturbed. Instead of ruining the surface of your skin to temporarily remove hair, laser hair removal will permanently target and eliminate the root by targeting the melanin in the follicle. This leaves the surface of your skin intact and undamaged. See a demo. Laser hair removal will permanently target and eliminate the root by targeting the melanin in the follicle. This leaves the surface of the skin of your armpit intact and undamaged. Laser hair removal for your underarms is the best way to remove unwanted hair. It’s always T-Shirt season. No more razors or long-sleeves because you forgot to shave. You’re always ready to go! Comfortable Treatments. Unlike a painful wax, you’ll comfortably remove your underarm hair and you won’t see a single tweezer or sticky substance in sight. Never Shave Again. With Milan’s exclusive Unlimited Package™, your results are guaranteed for life. As in, forever and beyond, at no additional cost. we believe in our lasers, and we’re willing to prove it by offering unlimited sessions with every package. Laser hair removal, because your underarms should be soft, smooth and one less chore for you to worry about every day! Permanently smooth skin is in your future.